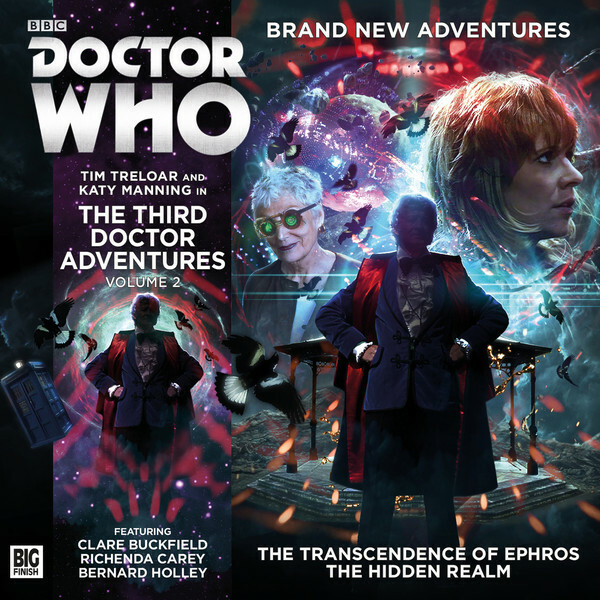 ‘The Transcendence of Ephros’ kicks off the second volume of Big Finish’s The Third Doctor Adventures, once more placing Tim Treloar’s uncanny impersonation of Jon Pertwee’s iconic Third Doctor alongside Katy Manning’s Jo Grant to further delve into this beloved televised era. The Third Doctor era is quite distinctly divided into the Earth-based UNIT stories and the off-world adventures, both types often featuring a deeper level of social commentary than in other eras. Set on the mysteriously dying planet of Ephros where Galactux Power Inc is exploiting its remaining resources, ‘The Transcendence of Ephros’ perfectly encapsulates the best elements of the off-world stories of the time, channeling ‘The Curse of Peladon’ to great effect in particular as the Doctor and Jo use another’s assumption of their identities to become entangled in a complex tale of intrigue and machinations that also sees Jo take on a very proactive role. The transcendence of the title refers to a religious group’s belief that the imminent explosion of the planet will carry them to the next plane of existence; though the Doctor finds it hard to stand by and let innocent people sacrifice their lives for their belief in the afterlife, he must acquiesce to their position that they are harming nobody but themselves and that they are legally entitled to the land due to the matronly Mother Finsey’s accepted settlement claims. As the Doctor strives to reclaim his TARDIS after it falls deep into a chasm as the planet shudders apart and Jo stays with Mother Finsey to learn more about this religion, much deeper truths are uncovered as their Galactux covers are quickly blown. The story that results intertwines several disparate threads, but each is given ample time for thorough exploration as the pieces slowly come together to form a rewarding and cohesive whole. When the Doctor points out that planets inherently cool down and so have no logical reason to explode like a sun would, it seems initially as though Galactux is running a scheme that will make its shareholders rich while also making it one of the most powerful entities in the cosmos, regardless of the deaths of the believers on the planet’s surface. However, through the discovery that the planet’s core temperature has been steadily rising, causing the failure of crops that led to the initial settlers’ decision to evacuate and thus leaving the land open and uncontested for Mother Finsey’s settlement claim, a much more complex truth that hearkens back to the Time Lords themselves is revealed. Though the religious group is full of devout followers ready and willing to accept death to reach a more enlightened state, it’s not wholly surprising that the religion is founded upon a false premise propagated by Mother Finsey. Richenda Carey is absolutely superb as this religious figure, and she excels even more after writer Guy Adams introduces a masterful twist for the character that changes preconceptions and notions about this particular era in general, fleshing out her character’s and this planet’s past wonderfully and excitingly. The similarities between Finsey and Jo and their experiences are made abundantly clear as well and eventually hint at life for Jo after she decides to leave the Doctor, and the two form a great double act even as events take a much more insidious and tense turn. Bolstered by very strong direction and guest performances, ‘The Transcendence of Ephros’ perfectly evokes the atmosphere of the non-UNIT Third Doctor era, the Doctor leading the charge and forging new allegiances as necessary and Jo proving perfectly able as she bravely confronts a sinister foe who, in a way, acts as a mirror for herself. Tim Treloar continues to excel in Jon Pertwee’s iconic role, and ‘The Transcendence of Ephros’ unflinchingly delves into the past to offer a fascinatingly rich and rewarding tale that is easily the best of this fledgling range so far.